The Ebony Chinese War Sword is an historically inspired replica that is a collector's dream. It features a 17 3/4" stainless steel blade with a sharp edge and has an anodized black finish for a sleek, non-reflective appearance. The handle is encased in imitation ray skin and traditionally wrapped in black cords. An open-hole circular pommel completes the handle design, and a nylon shoulder scabbard completes the package. 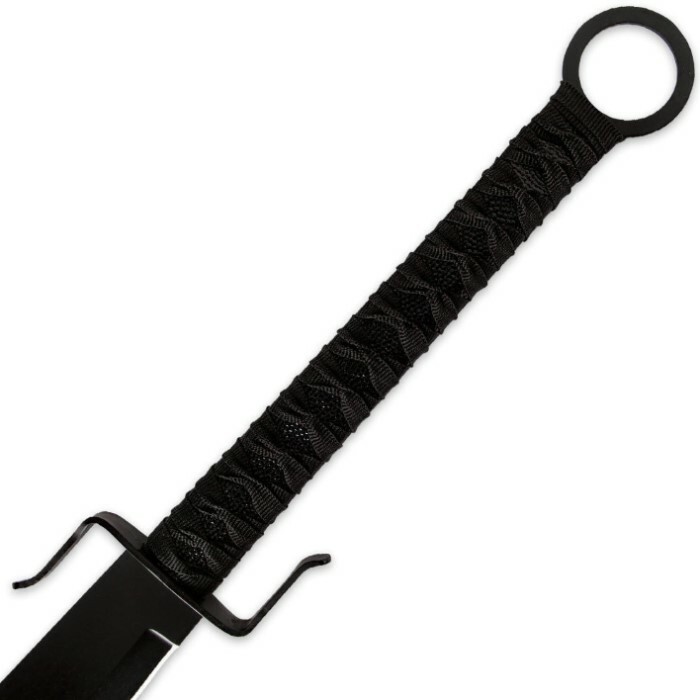 This Chinese War Sword is a great buy. The only complaint is it could be sharper,but that's easily taken care of with minimal effort. I am very pleased with this product. Got for a wall hanger but confident will be a home protector if opportunity forgets to knock. You can tell the wrap is cheap...that's a given...definitely not silk... But past that, it's an awesome item. The blade isn't especially sharp, but with a couple of stones, I got it scalpel-like! I picked it up on Valentines, 10.00 bucks only...4.99 shipping...AMAZING purchase for the price. Heavy blade. nice construction, nothing wobbles or rattles... Aside from the cheap cloth used, this is at least an 8 out of 10 stars! Got this beauty in a $10 sale. 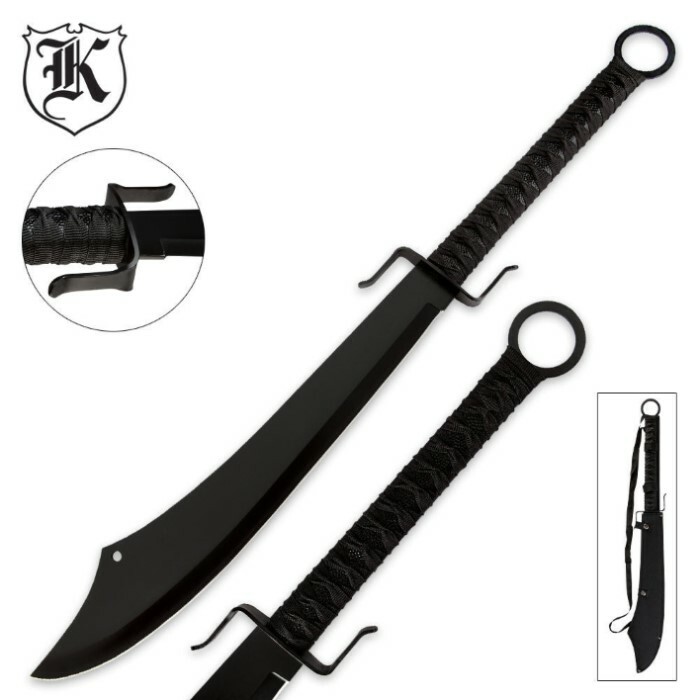 Nice and sharp out of the box.It's a short sword overall, but with a thick blade and long handle, it gives great chopping power, making a pretty effective machete. Handle wrap isn't bad, looks nice, feels durable, might need to rewrap it later on after some use though. 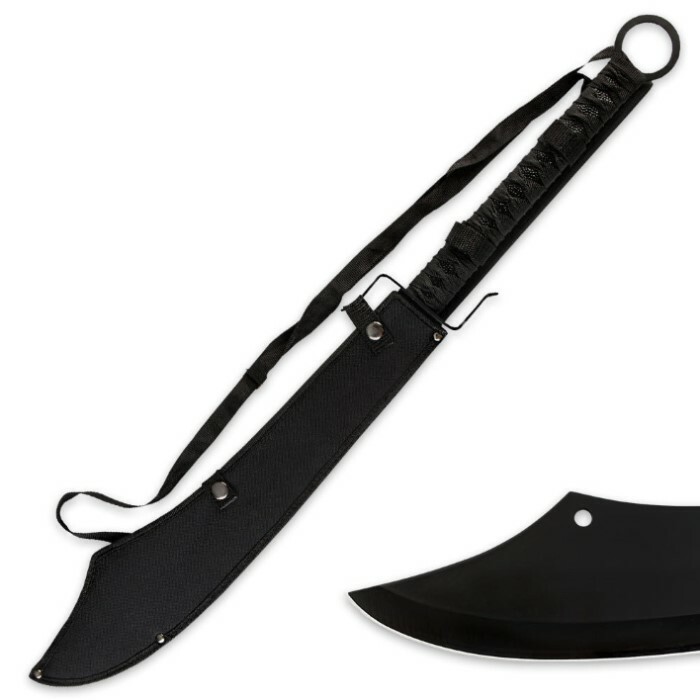 The sheath is alright, it's good for storing with snap-in clips for the back of the blade, but the straps are too thin and feel really flimsy. Overall a great buy.